Oh look, a monster! I'M GOING TO MAKE A HAT OUT OF IT. I'll admit this up front. This is my very first Monster Hunter game, and well, they have a... reputation. We always hear about how each new series release fires up the Japanese hype machine in ways that only Dragon Quest can match, and how it nearly single-handedly kept the PSP platform alive overseas. Each time Capcom brings the games stateside, a vocal minority sings their praises, but the series hasn't caught on in the mainstream yet. 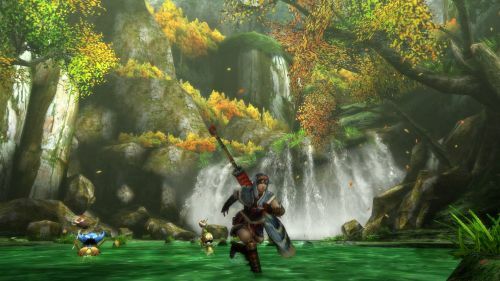 I don't think Monster Hunter 3 Ultimate is going to change that, but it provides a pretty good place to jump in. ...that is, if you're willing to put the time to learn the many, many nuances of the series. Once you've got a good grasp of things, you'll forget you ever had trouble, but my first few hours were spent constantly consulting guides. You'll have your hand held through the first few tasks, but once you unlock the Hunter's Guild, the gloves are off. In a nutshell, the cycle of a Monster Hunter game works in phases. First, you'll build up your stock of consumables/ensure your gear is in order. You can do this by purchasing consumables, or using the Farm in your town to grow items to combine into potions, etc. You might dip into one of the zones to gather ores and other materials as well. Next, you hit up the local Hunter's Guild to pick up a quest - quests ask you to do many things, like harvesting local plant life, to killing a number of low-grade monsters. Once you've done enough of the lower-tier quests, you'll receive an “urgent” request to take out a more difficult monster. Completing the urgent quests will raise your Hunter Rank, allowing access to new areas, quests and more difficult monsters to slay. 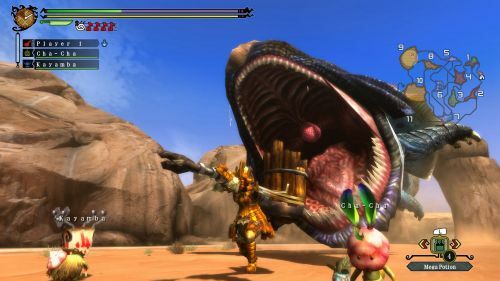 Slaying the large monsters is the series' bread and butter, and is by far the most exciting part of the game. The large monsters will often flee to other areas of the zone, and if you're not quick in tracking them down (tagging one with a paintball helps enormously), they can recover hit points. Often, they'll be lying in ambush when you zone into the new areas, so be quick on your feet. Certain monsters will also call for backup, so be careful if, say, you see a Great Jaggi near its smaller variants. Killing monsters allows you to skin them, and in turn, the materials you receive from skinning allow you to craft stronger or more specialized gear. Crafting is at least as big a part of the game as the actual monster hunting, so you'll want to collect as many materials as possible. Once you've upgraded your stuff? It's time to stock back up and hit the Guild for another quest. As a solo game, MH3U can feel exceptionally grindy. The need to farm up resources both through killing/fishing/mining and literally farming eats up a bit more time than I'd like to spend. Combat is very deliberate, regardless of what weapon you're carrying, and you're unable to cancel/dodge out of a move until its animation completes, which makes missed swings an enormous liability. If you're a newbie like me, stick to faster weapons like the sword & shield of the dual blades. One gripe I actually had was that the UI text is way too small for readability - I can't imagine anyone still rocking an SDTV being able to make out any of the text, and I actually had to scoot my couch closer to the TV to make out some of the text. If you've got a giant TV or sit close, this might not be an issue for you.